Brad loves Chinese food - in fact, can't hardly get enough of it. We've noticed recently that while Walker is picky about some things, he seems to inhale Chinese food, veggies and all. 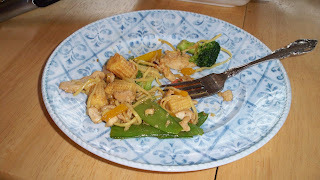 We've tried a few stirfrys before, usually without much success. This past week we decided to try again and feel like we found a recipe with LOTS of potential. Now keep in mind...this is one of those recipes that you probably want to adjust to your tastes and play with over time...I know we certainly will! Heat oil in wide-mouthed chef’s pan or wok. Add chicken & stirfry – our chicken was still partially frozen when we added it, so it added a lot of liquid to the pan while cooking. (We decided that next time we should cut the chicken earlier in the day while it was still partially frozen and then allow it to thaw in the fridge and drain or pat it dry before adding it to the pan to forgo the additional moisture.) Once the chicken was cooked we added the carrots, peppers & snow peas…definitely wait to add the snow peas if you make this recipe! They ended up a little on the soggy side L. Feel free to drizzle in a little sesame oil for added flavor. Sprinkle in sesame seeds. Once the carrots have cooked a few minutes, add broccoli, baby corn, cabbage and snow peas. 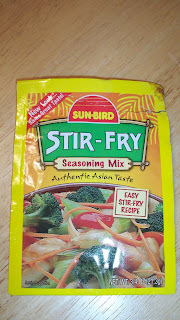 When broccoli is crisp-tender add the stirfry packet (already prepared according to packet directions) – Brad said next time he would also add some additional soy sauce at this point. 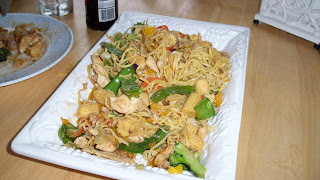 Add the stirfry noodles, give everything a good toss/stir to get it all coated and transfer to a serving platter. Enjoy! 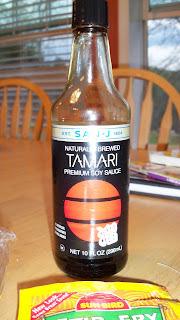 This is the brand of soy sauce that our favorite Thai restaurant uses. I'm pretty sure we found this seasoning packet at Wal-Mart. 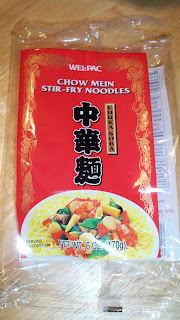 Noodles definitely came from Wal-Mart. They were also quite yummy plain. 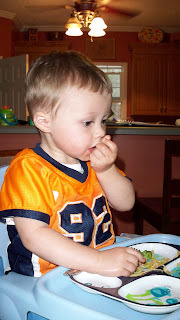 Walker was downing noodles, baby corn & carrots like there was no tomorrow. We fed him leftovers the next day and he cleaned his plate - woo hoo!